Box spring beds are all the rage, or so it seems. However, outside the US, most countries are only just taking up the idea of having a box spring bed, and all of those people have slept perfectly well without it so far. So, yes, there are alternative ways of getting a comfortable night’s sleep without lying on box springs, and yes, there are also good reasons to not opt for box springs even if they are the norm where you live. But before we get into alternatives and substitutes, let’s first have a look at what box springs actually are and what they do: Basically, a box spring is a shock absorber for your mattress. And since stacking a mattress upon a dedicated “box” that provides shock absorption naturally leads to added height, box spring beds are often chosen when the buyer prefers to have a high bed. And that’s about it. So, box springs are just a way of making a bed more comfortable to lie (down) on. But as the rest of the world knows, there are quite a few ways to achieve the same without the use of box springs, some of which actually preclude using them. 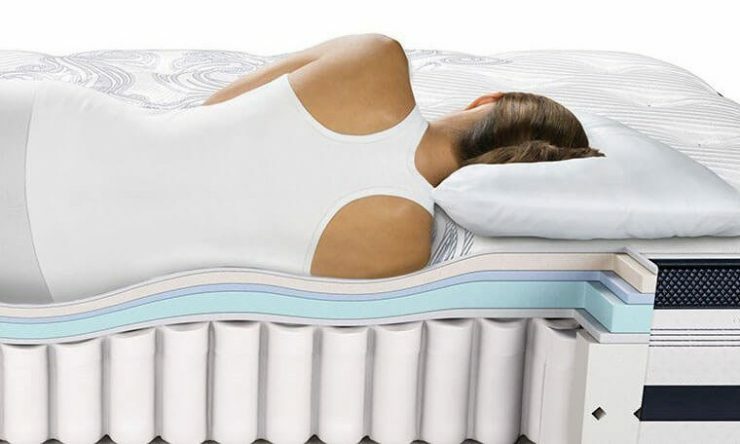 Below we have collected the best alternative ways to bed yourself comfortably and in a good, relaxing posture without this staple of US bedrooms for you. Memory foam mattresses are, as the name suggests, made up from a foam that perfectly moulds to the body, giving perfect support in all places that need it. 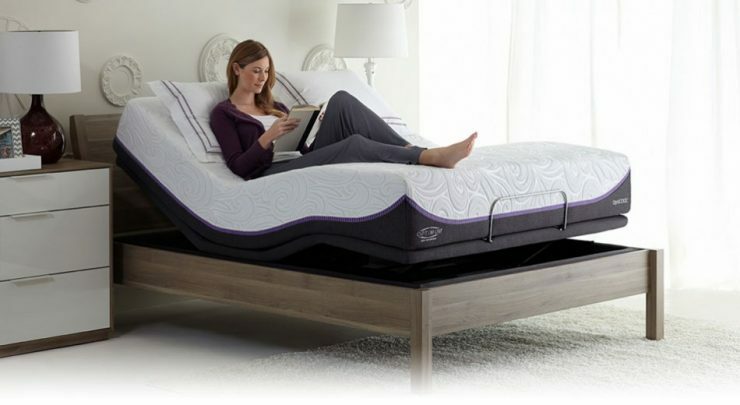 Memory foam mattresses are incredibly comfortable and are the perfect choice for people dealing with (chronic) pain. Additionally, they are incredibly allergen-repellant. While memory foam mattresses can be a bit pricier than other options, you can save the additional amount of money by going with the cheapest “base” available – usually simple, basic wooden slats are all you need. The innerspring mattress is also known as “coil spring mattress” and basically has the springs already incorporated inside itself. There are a variety of coils and manners of processing available, giving you a wide choice of firmness, springiness, and durability. There is a very simple explanation why additional box springs are not needed here: you’d just double-spring your bed! And while the added springiness might be fun for kids bouncing around, it really isn’t the way to go if you’re looking for a restful sleep. A hybrid mattress is basically a mix of the two options we mentioned above. The base of the mattress has springs (typically pocket coils) incorporated, and the top-most layer (typically there are more than one upper layers, made up from various malleable materials) is made up from memory foam for comfort and optimal support. Since the hybrid mattress has all the best characteristics of innerspring and memory foam mattresses combined, a box spring is made redundant here as well. Platform beds are the perfect alternative when your reason for turning to box springs is that you’re looking for a tall bed. Generally speaking, platform beds tend to look much better than a box-spring bed. These days, platform beds come in great variations, the looks ranging from a reduced, modern design like the “floating” bed in our example photo to classic four-poster beds complete with drapes, and therefore give you a wide range of choice when it comes to upholstery, incorporated headboards and the like. Adjustable beds offer maximum comfort for all situations – whether you like to read, work, watch TV, or just lounge around in bed, you will be able to find the perfect position for whatever activity you are about to enjoy. Most likely, you will have encountered adjustable beds in health-care settings before – be it at a hospital, at the home of a bedridden individual, or in connection with chronic pain patients. And while adjustable beds offer tremendous health benefits (they simply are the best choice for adjusting to individual needs (elevated legs/head) and help greatly with circulatory problems), that’s not all there is about them! Slats basically are nothing more than wooden boards crossing the width of your bed frame and forming the basis where the mattress rests on. Plain (wooden) slatting that just supports the mattress on the frame is the most basic option. And probably the one you’re most familiar with. This type of slats combines best with memory foam, innerspring, or hybrid mattresses since those do not need any additional absorption. The second type are slabs that are resting on some type of springs (as in our example picture). Those can also often be individually adjusted to your body’s needs when it comes to support, and work with any mattress type. 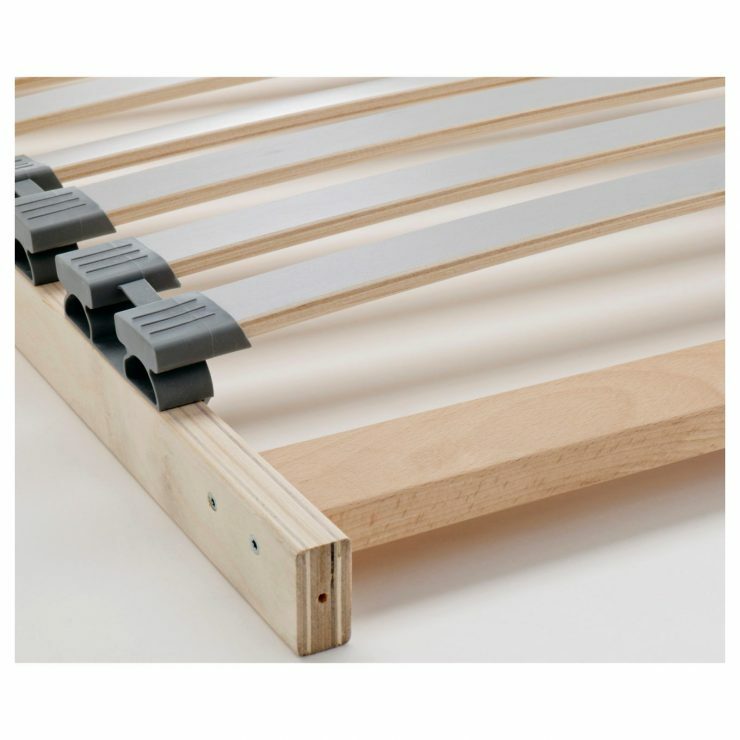 Springy slats provide good shock absorption without having to restore to box springs or pricey mattress alternatives. A truly good mattress really doesn’t need more than a firm, plane base to rest on, no matter what else you might have heard. For those who don’t need a bed frame, or like a basic look, the combination of floor and a good quality mattress can be a valid alternative! The Japanese have slept like this for centuries, and the futon trend becomes more and more established in the western hemisphere as well. 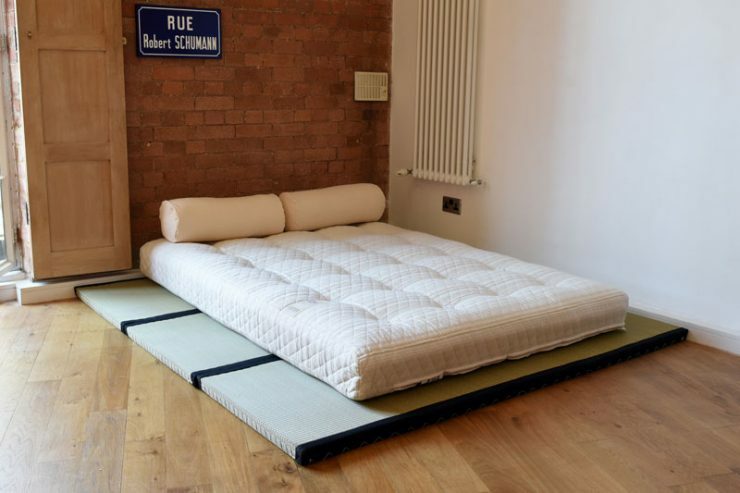 If you feel like you want to have at least something between your floor and mattress, a Tamati mat like in our example picture may be something you want to look into.